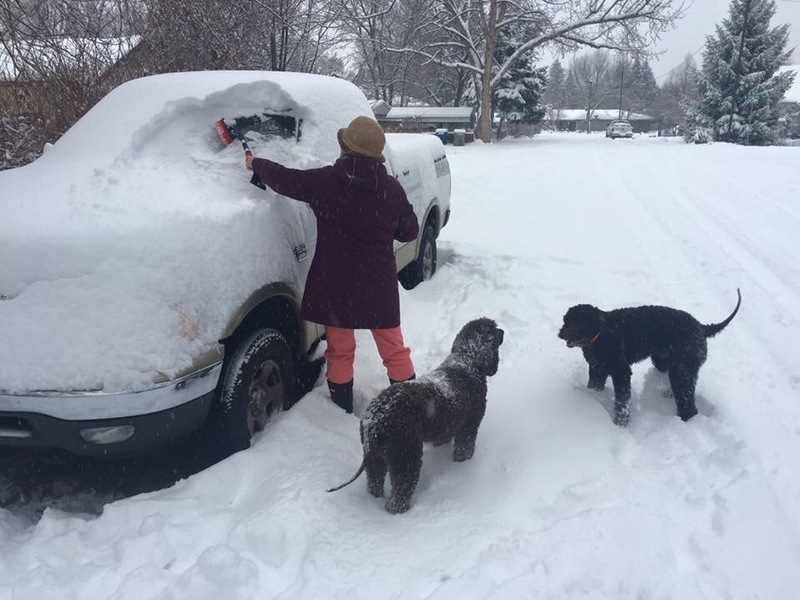 Since about noon yesterday, Boise got about 8 inches of light fluffy snow. So this morning, up and down our street, neighbors were shoveling driveways and brushing snow off their cars. 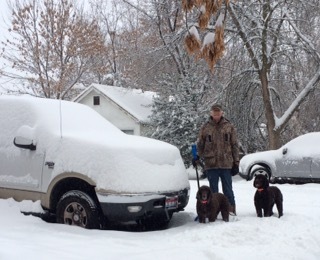 Wanting to fit in (and also wanting to be able to drive), Russ did the driveway, and I did the car and truck. 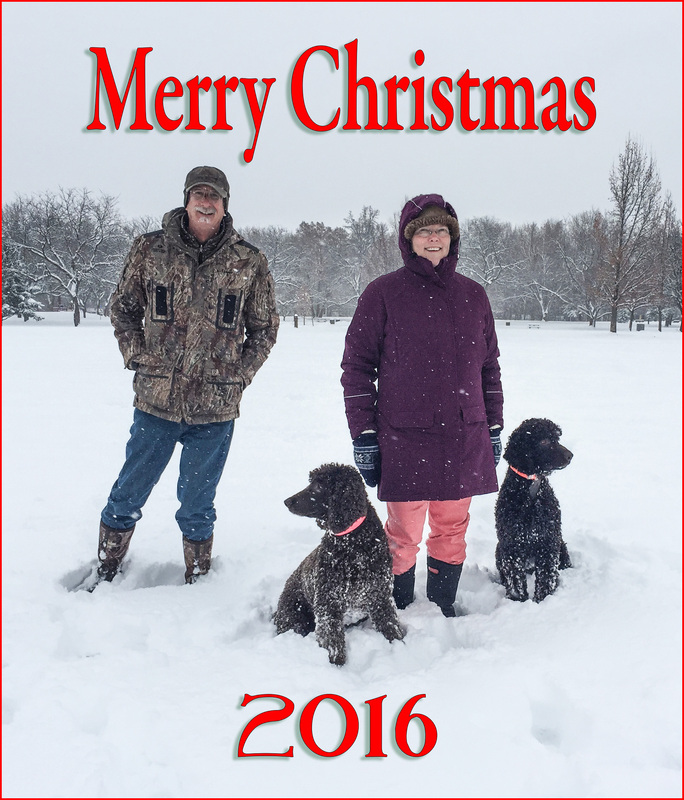 As per usual, the dogs helped. She smiled, and I smiled back as we each went on our own way. 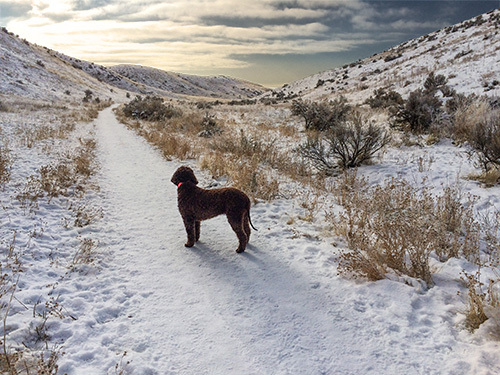 She was headed out into the Boise foothills with her dog, and Tooey and I were headed back in to work. At the time of this photo, we were about 20 minutes away from the building, which is nestled right into the base of the Boise foothills. 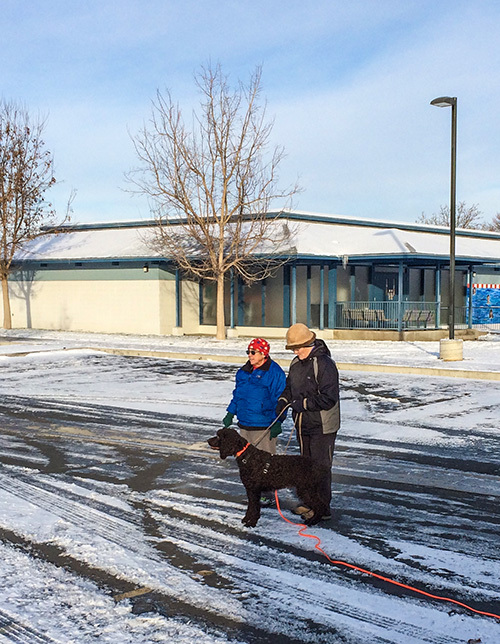 The building is so close that its parking lot is often used by folks who bring their dogs to walk or run the trails. But from where we were, you could look out south, toward the building, but not see it. Just snow, juniper and other desert plants, and the cloudy skies that will bring more snow tomorrow. And she’s right. I am lucky. Not just for the reasons she stated, but also to have this winter landscape so close, and a companion handy to explore it with. But you know how, when talking about desert heat, people say, “But it’s a dry heat”? Well, the same thing can be said about the cold here in Boise. 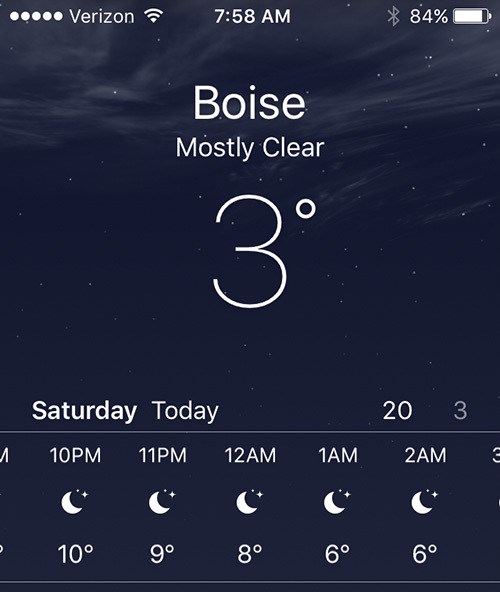 It’s a dry cold, and when it’s dry and not windy, 3 degrees isn’t quite as bad as I thought. Of course, I did have on three layers of long underwear, fleece, and windbreaker, neck to ankle, and lots of wool everywhere else. That helped, too. I tracked with Dino again today, and she and I talked strategy. Dino suggested that today Carlin should track his first corner. In other words, he’d track Dino’s scent a distance in one direction, and then, hopefully, he’d find the spot where she turned a corner, and make that same corner himself. Carlin was sure something was up when I moved the long line from his collar to his harness. 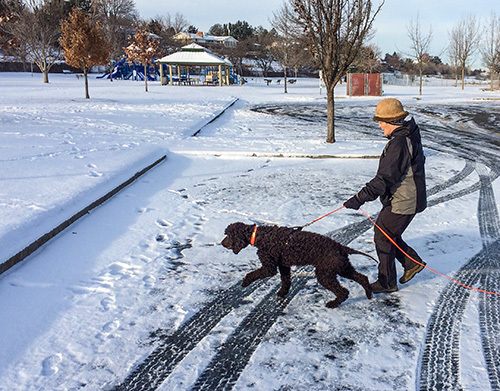 He was, thankfully, good about not pulling me off my feet on the icy asphalt, but he definitely eager to go. We got to the start flag, and Carlin gave Dino’s knit hat a good sniff. I told him to “Track!”, and off he went. Pretty fast, too. Fortunately, he didn’t go so fast that I had to run, but for sure I had to move right along. In the picture below, he’s about halfway to the corner. I don’t have any photos of the corner, but when he got there, he kept going straight for a bit instead of turning to the left. This is training, and the corner, made by footprints in the snow, was obvious to me, so I just stopped at the corner and held onto the line so Carlin couldn’t get too far off track. I pointed to one Dino’s footprints, and when Carlin came back to me to see what I was pointing at, I told him to “Find your track.” He circled the corner a couple of times, looked up a squirrel in the big tree but (YAY!!!) ignored it, then put his nose down again and picked a direction to go. Fortunately, it was the right direction. He went along that way for a bit, and then came to a section of disturbed snow. Some large animal or two had really kicked it up sometime earlier in the morning, and Carlin got distracted sniffing around. But after I pointed again at a foot print and reminded him to “Find your track,” he got through that, kept going some more, and then found Dino’s “lost” glove. I don’t know exactly how long each leg of the track was, but I’m guessing the first one was 40 yards and the second was 80 yards. I was pleased. This is only Carlin’s 4th time out, and he found his track and his glove. I think we’re going to love this. Note about tracking in the snow. I wondered if Carlin couldn’t just see the footsteps, and simply follow them. That would be cheating. Plus there won’t always be snow or foot prints to follow in a tracking test. Or, if there are foot prints, they might not be the real track. If the tracking test for which I was a tracklayer is any example, there can be stuff on the ground that looks like a track but isn’t — things like foot prints made by people jogging through the area, little flags placed by retriever trainers, plants crushed by other animals passing through, etc. And then, when I saw Carlin initially go straight at the corner, I knew he wasn’t following the foot prints themselves. Carlin and I had our second lesson in tracking yesterday. Dino, whom I worked for during the tracking test last month, invited me and other woman with her Golden Retriever out to help us get our dogs started. The weather was cloudy and cool, but not cold, and by Boise standards, rainy. (By Portland standards, it was a bit drippy.) The area was a field of short-ish, mowed grass-like plants in a local Idaho state park. I personally had a blast. Carlin looked like he was having fun, too. It was a short lesson. First Dino advised me to start putting together a “start routine” — a pattern of behavior that Carlin and I would repeat before every tracking practice, and eventually, every tracking test. So I got Carlin out of the car with his leash on his collar, put on his tracking harness (the same one I got for Cooper many years ago but didn’t use much), and then took him for a short walk. Then we walked out to the grounds where Dino was getting ready to set the track. 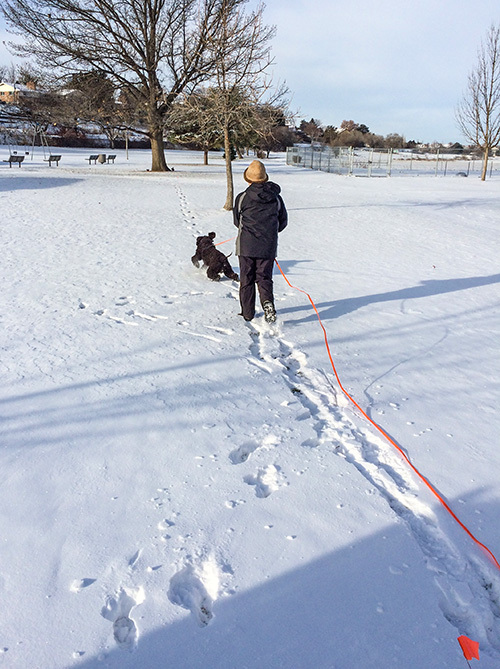 Once we got there, I put the long line onto Carlin’s harness, took the leash off his collar, and had him sit. Dino placed a scrap of fleece and a small flag in the ground, walked toward a distant traffic sign for 20 yards, and then turned and called to Carlin, waving a glove. She then put the glove (back-side down) on the ground, and tucked several tiny pieces of pepperoni under the thumb of the glove. Then she walked perpendicularly off the course. 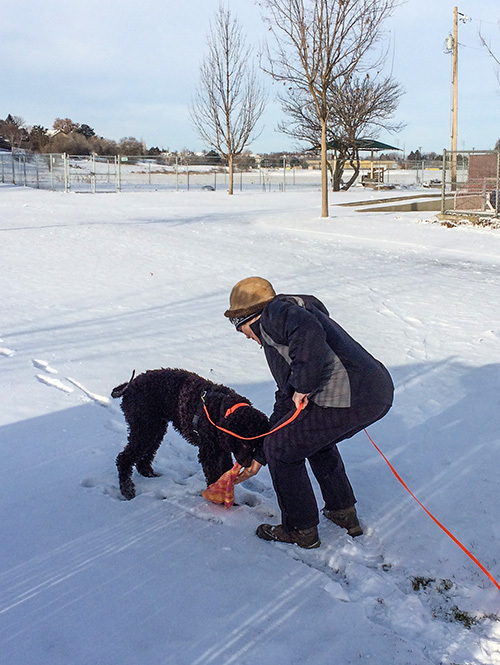 Once Dino arrived back at the start, I put the fleece scrap up to Carlin’s nose and sent him off with a “Find it!” (a command he knows from an indoor game we play), followed by a “Find your track!” (a command he’s never heard before). He took off, nose down, straight toward the leather gardening glove. He never left the track, rarely lifted his nose from the ground, and quickly located the glove. He gobbled the treats off the glove. (Carlin loves pepperoni.) Good boy! We played tug with the glove for a few seconds, and then walked off the course. We then moved about 30 yards away from the first track, and Dino laid a second track, this one 40 yards long. Same procedure, same result. Good boy! The last track was 80 yards long. On this one, Carlin easily got to about 60 yards, but then lifted his head and looked back at me. At this point, I was only about 10 feet behind him. I just repeated my sequence of commands, “Go find it! Find your track!” He put his nose down again, and quickly located the glove. This time he gobbled the treats, picked up the glove, and brought it to me to play tug. 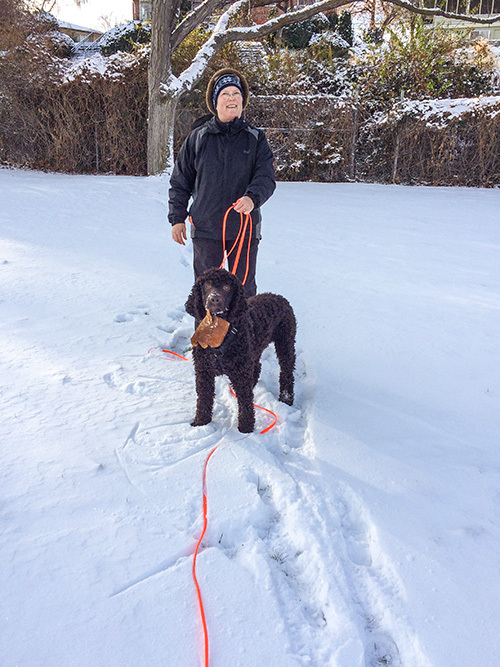 After a short tug session, I let him keep the glove as we walked back to the car. I have homework. This will be a challenge this time of year, since I go to work in the dark and come home in the dark. But we’ll figure out something. Carlin is obviously a natural at this, and I love doing things with my dog that the dog loves doing. I was pretty sure that Carlin had talent based on our very first lesson, given by Mary Thompson a couple of years ago. Carlin was just over 6 months old, and she and I were both visiting some friends in Washington state. I had always hoped to get back to tracking, but most of my tracking friends in Portland practiced or gave lessons only during the week. I work during the week, and my weekends were filled with other dog activities. So I never pursued it. But now we live in Boise, and things have changed. So we’ll give this tracking thing a try, have a good time, and see what happens.